238 pages | 9 B/W Illus. From his early economic works on, Marx conceived the labour of any kind of society as a set of production activities and analysed the historical modes of production as specific ways of distributing and exchanging these activities. Political economy on the contrary considers the labour only under the form of its product, and the exchange of products as commodities as the unique form of social labour exchange. For Marx, insofar as the labour creating value represents a specific mode of exchanging the society's living labour, general and abstract labour cannot not only be defined as the substance or measure unit of the commodity, as in Smith or Ricardo, but foremost as an expense of living labour, i.e. of nerves, muscles, brain, etc. Hence the twofold nature of living labour, as a concrete activity producing a use value and an expense of human labour in general producing exchange value. Marx himself claimed that this twofold nature of labour creating value was its main and most important contribution to economic science. This book aims at showing how both determines the original categories and economic laws in Capital and constitutes the profound innerspring of Marx's critique of political economy. 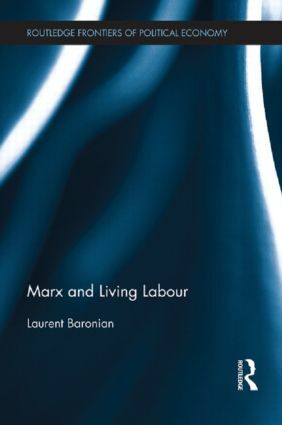 The role and function of living labour is highlighted by dealing with the difference between Marx and Classics' theories of labour value; money and the problems of its integration in economic analysis, especially in Keynes; the transition from feudalism to capitalism; the theory of capital through a discussion on the Cambridge controversy and the transformation problem; the labour process and the principles of labour management; unemployment and overpopulation; the formulas of capital in the history of economic thought; finally, an interpretation of the current crisis based on Marx's conception of overaccumulation and speculation after having distinguished it from underconsumption and stagnation theories of crises. Laurent Baronian is Assistant Professor in Economics at the Université Paris 3, Sorbonne-Nouvelle, France. In recent years, there has been widespread criticism of mainstream economics. This has taken many forms, from methodological critiques of its excessive formalism, to concern about its failure to connect with many of the most pressing social issues. This series provides a forum for research which is developing alternative forms of economic analysis. Reclaiming the traditional 'political economy' title, it refrains from emphasising any single school of thought, but instead attempts to foster greater diversity within economics.